While the flowers in this photo resemble St. John’s Wort, it is unconfirmed whether these indeed are St. John’s Wort flowers. See what you think: Click here to compare. Whether wintering at home or abroad, the short days and long nights of cold weather months can bring about a condition called SAD i.e. Seasonal Affective Disorder. SAD is a type of depression and is characterized by various symptoms such as lethargy, appetite changes and feelings of, well, sadness. This can affect the mood and activity level of individuals to varying degrees. There are a number of treatments in the alternative health realm to help manage SAD. 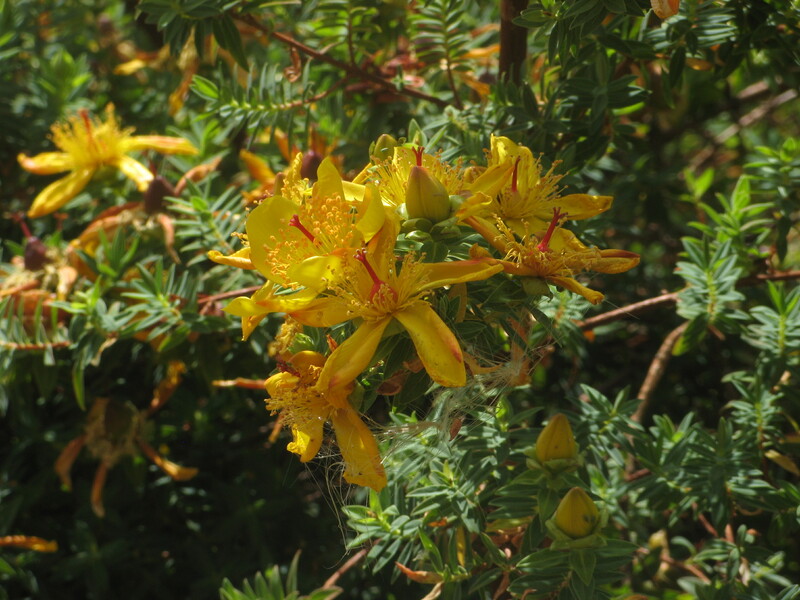 In the first of a 3-part series, we would like to introduce you to St. John’s Wort. St. John’s Wort (hypericum perforatum) is a perennial with yellow flowers and has been used in aromatherapy for wounds, sunburns, bruises and easing the pain of sciatica and rheumatism. It is anti-inflammatory, astringent, vulnerary (i.e. wound healing) and anti-rheumatic. Typically St. John’s Wort oil is used topically – an oil is created by macerating the flowers and leaves in olive oil. It also comes in tincture, tablet and tea form. With regards to SAD, St. John’s Wort has been used with success in some individuals for treating mild to moderate depression and anxiety. If safe for you to use, traveling with some teabags of St. John’s Wort is an easy way to help deal with the ‘winter blues’. Wildwood, Chrissie. The Encyclopedia of Aromatherapy. Vermont: Healing Arts Press, 1996. Print.